Ever since Marcel Wildhaber had been spotted riding a Scott Sports frame with discs and a wholly inventive paint job, there have been many cyclocross fans anxiously awaiting further details on when Scott Sports would be releasing their new cyclocross bikes for the general public. 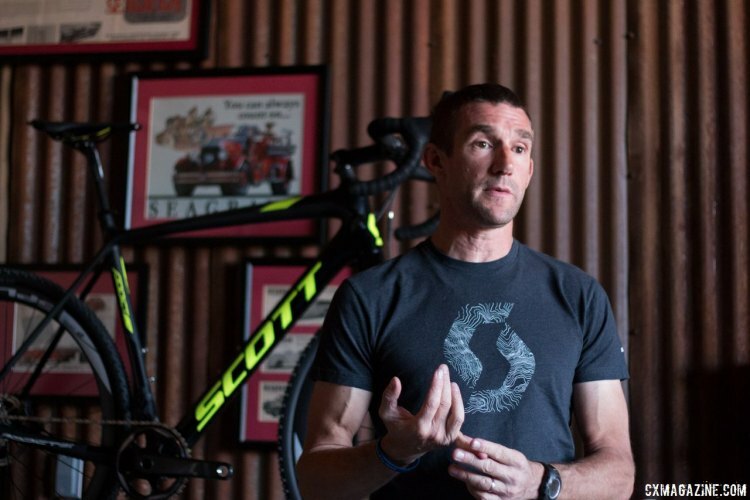 The night before 2015 Sea Otter began, Scott Sports unveiled their latest model, the Addict CX, along with some good and bad news. Before we dive into the extensive details of the 2016 Addict CX, we’ll hit you with possibly the most disappointing update: The gray camo paint job will not be available to customers. The scheme had been fully intended as a prototype-only finish, and was inspired by the same design that Cadillac uses to discourage paparazzi from taking clean photos of their beta model performance cars. 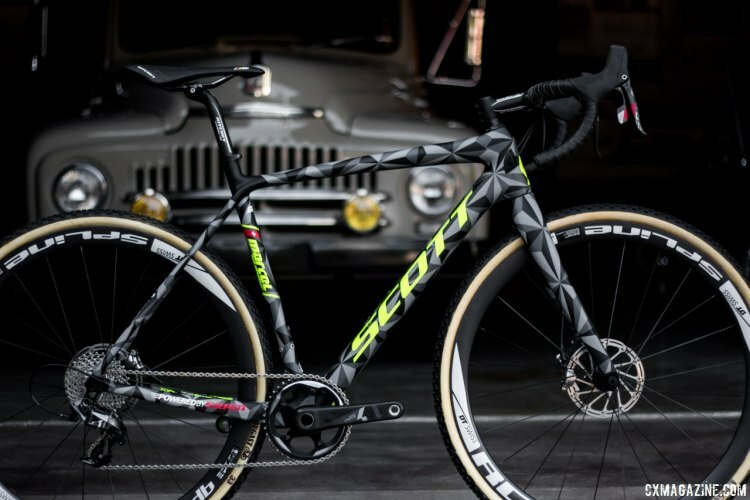 Instead, a mixture of a gloss and matte black combination accented with yellow hi-viz will make up the final colorization of their Addict CX 10 Disc, which is set to be availble in August for $5899, alongside the aluminum counterpart, the Speedster CX 10 Disc, which will retail for $1699. The model that seeks an in-between pricing, the Addict CX 20, will only be availble in Europe. 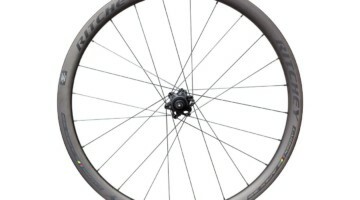 Use the slider below for the in-depth details of the Scott Sports Addict CX 10 Disc and a full spec guide, below. Scott is fashionably late to the cyclocross disc party, but is making quite the entrance. 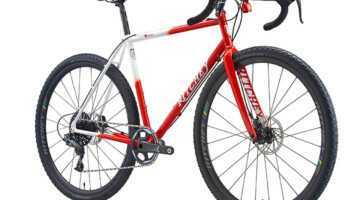 The company didn’t even list a cyclocross bike last season, pulling the plug on its successful and ultralight cantilever, the Addict CX. However, the time spent wasn’t time wasted. 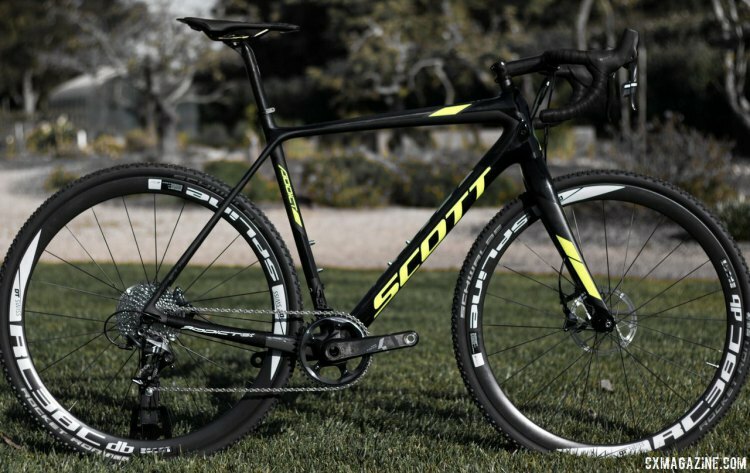 Scott wanted to make sure that their latest iteration of the Addict CX would properly incorporate all the latest technology, and after looking at their newest model, it shows. At Sea Otter, Scott Sports’ US Marketing Director Nic Sims walked us through the small details, but larger one is perhaps the most impressive. 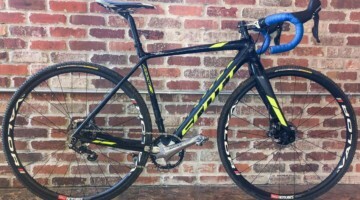 According to Sims, the new Addict CX frames are the lightest availble for a cyclocross bike. With a 54cm frame weighing 890 grams, and disc fork coming out to 360 grams, the total weight comes out to 1250 grams, which is lighter than some carbon frames without a fork. 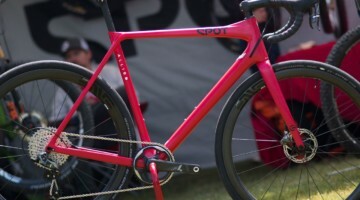 The frameset is 60 grams lighter than the previous cantilever version of the Addict CX, and that model was already one of the lightest cantilever frames available. Ooo it’s a Festka paint job! Yes please!!! A very big WANT for this racing machine. 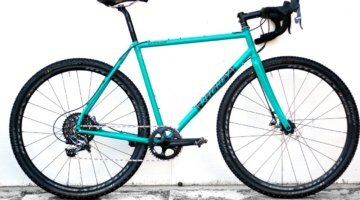 Nice but how long would one expect an 890 gram CX frame to last if raced and ridden hard? That sounds like it’s seasonally disposable. 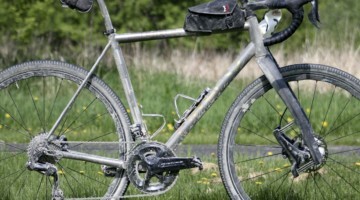 But what do I know, I invest in “old school” Ti for my CX frames. That’s 2 lbs ! That’s sick !